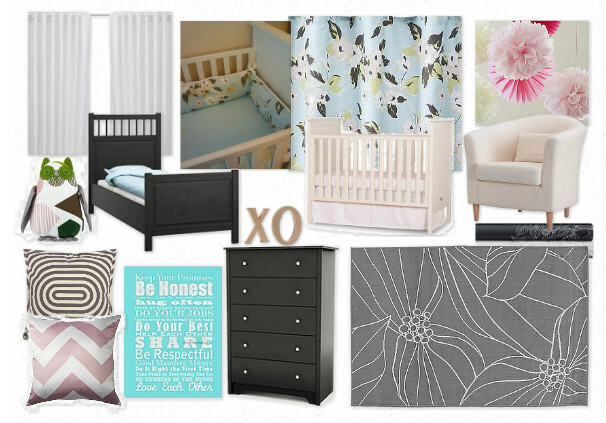 Here is a design board for a nursery/ kids room I did about a year ago. For my kids to be exact. My son was three and my daughter was on the way. They share a room, so the design needed to be a good balance for both. I wanted a little touch of girly, but nothing that my son couldn’t handle. A few things strayed from the original design, as most jobs do. Pictures to come! So no pictures have come yet, because I just can’t seem to finish their room. Oh, being a designer it is very hard to ever be satisfied with your own spaces. So the design board has changed a bit and its still changing. =) Lets see how it continues to evolve until I finally show you their room.